By kind permission of Richard Curtis and Tiger Aspect Productions and supporting Comic Relief. The Vicar of Dibley was created by Richard Curtis and written for its lead actress, Dawn French, It aired from 1994 to 2007. 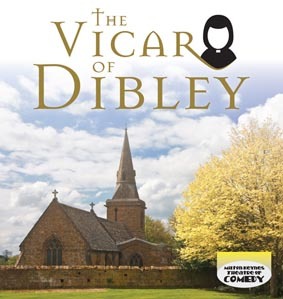 It is set in a fictional small Oxfordshire village called Dibley, which is assigned a female vicar following the 1992 changes in the Church of England that permitted the ordination of women. In ratings terms, the programme is among the most successful in the digital era, with the various Christmas and New Year specials in 1999, 2004, 2005, 2006 and 2007 all entering the top 10 programmes of the year. The Vicar of Dibley received multiple British Comedy Awards, two International Emmys, and was a multiple British Academy Television Awards nominee. In 2004, it came third in Britain’s Best Sitcom. The script was written by Ian Gower and Paul Carpenter adapted from the original TV series by Richard Curtis and Paul Mayhew-Archer. It featured plot and scenes sourced primarily from the first two series of the show aired between 1994 and 1998. Series one consisted of 6 episodes and series two only 4 episodes. Some of the later episodes and specials were also referenced. It covered events from the arrival of the new vicar through to the wedding of Alice and Hugo. The show was such a success we staged a sequel in May 2013. Tuesday 1st May 2012. 7.30pm. Wednesday 2nd May 2012. 7.30pm. Thursday 3rd May 2012. 7.30pm. Friday 4th May 2012. 7.30pm. Saturday 5th May 2012. 2.30pm. Saturday 5th May 2012. 7.30pm.